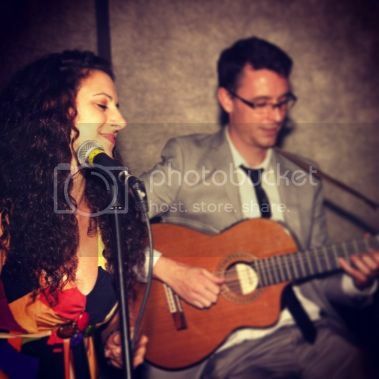 D&L Acoustic Duo are a dynamic duo available to hire for all kinds of social events across the South-East including Functions, Weddings, Corporate Events and more. Made of singer Lizzy and guitarist Duncan Howlett they play a wide variety of acoustic arrangements of classic & contemporary songs. Lizzy & Duncan have a vast experience in the music industry having studied, played, performed & taught for many years. The pair met when they moved to Brighton to study at the Brighton Institute of Modern Music and have been working together ever since. They played in some of Brighton’s best original bands, including the 8 piece original funk band The Grand Majestic who played at many prestigious venues & events. These included supporting The Brand New Heavies at Brighton’s Komedia, the Californian funk legends Breakestra at Brighton’s Concorde 2 & playing at London’s Lovebox Music Festival. They also co-ran the ongoing success that was Brighton’s Akoustic Karma Lounge, which were eclectic music nights featuring the best of Brighton’s acoustic bands and artists. These nights appeared at some of the best Brighton venues for many years. Both Duncan & Lizzy continue to write, teach & perform in many different forms and situations. All the time that they have spent working together has created a great dynamic between them which is portrayed in the music, making their acoustic duo a great and exciting addition to any event. Their repertoire is vast ranging from classic to contemporary and they are always willing to personalise their set around your event including any special requests you have. With top quality equipment, including a Mackie PA rig, they have all the equipment needed to provide a great sound at your event. They can also offer Duncan Howlett as a solo guitarist or Lizzy as a solo vocalist. For a bespoke performance package for your event get in touch now to discuss your requirements. please fill out an enquiry form with your requirements.